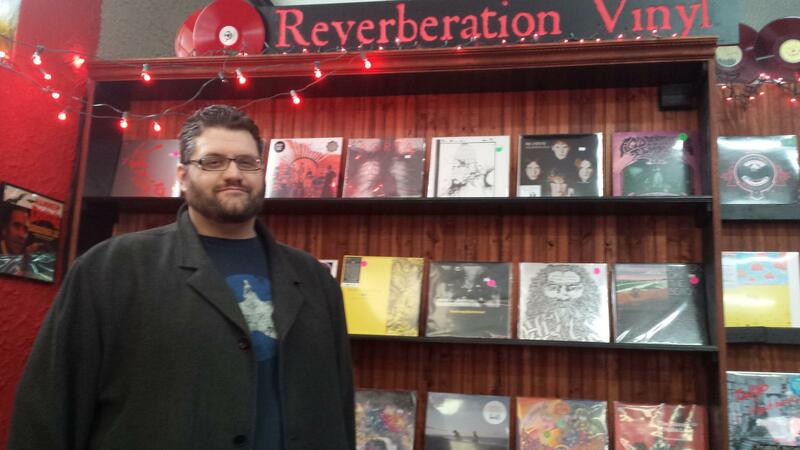 John Anderson inside his Reverberation Vinyl store in Bloomington, near Illinois Wesleyan University. John Anderson remembers as a 13-year-old in the 1980s walking into Mother Murphy’s, when uptown Normal was still downtown Normal. It was a long 21 steps up that narrow stairwell of the iconic store that’s been on North Street since the late 1960s. When Anderson and others reached the top step back in the day, it was often owner Mike Williams who offered a greeting. He still does. And though Mother Murphy’s still sells albums, the store's focus has changed in recent years. “A head shop, a hippie shop, a gift store, sure. A skateboard shop with Shockwaves,” Williams said. 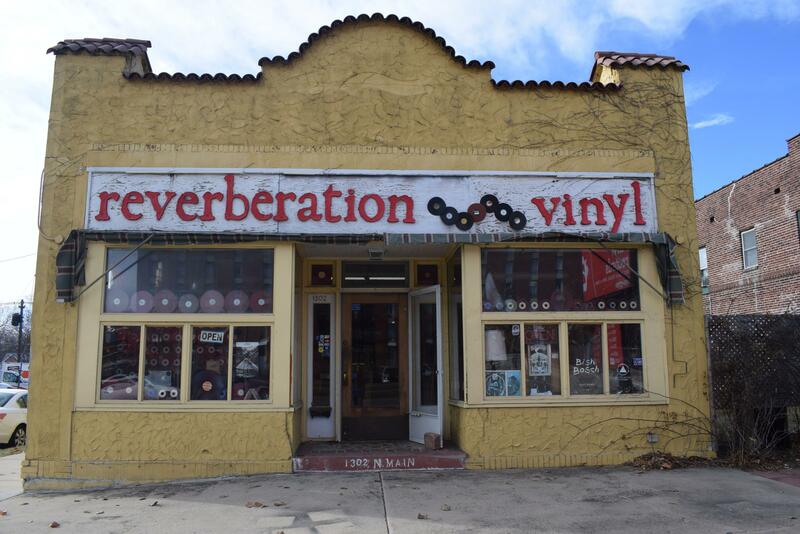 Reverberation Vinyl is the newest of the three local record stores. Anderson opened the shop in March 2011. “Yes we still have some albums,” laughed Williams. He remembers when Anderson was a music obsessed teenager. “Oh I’d see him several times a week. He’d be always going through the bins and grabbing up records he most wanted. Yeah, he was definitely one of my best customers,” said Williams. Anderson still buys stacks of vinyl. Now he resells them as the owner of Reverberation Vinyl on Main Street across from Illinois Wesleyan in Bloomington. It’s the newest of the three local record stores. He opened shop in March 2011, seven years after the birth of North Street Records and Waiting Room Records on North Street in Uptown. Anderson says the idea to start his own Record Store had been simmering since the late 1990s. That’s when friends were pointing to his immense record collection and encyclopedic knowledge of music. Anderson’s store sells 100 percent vinyl. About 65 percent used. But it’s his new music inventory that gets his mojo working … and where his business philosophy becomes unorthodox. Anderson loves, and thinks you should love, psychedelic and underground rock. He also thinks you should like free-jazz, folk, international. He’ll tell you it’s music you need. “If you want the Beatles, go look in the ‘B’ section. If you want to find out what kind of store this is and what I think you should have, go look at the walls, go look at the stuff on the racks. It’s the music I like, that I love, I think other people should love and I’m passionate about and that’s what I want to sell people,” Anderson said. It’s not what they teach you in business school. “Yet here I am,” said Anderson. Mike Williams of Mother Murphy’s also has a deep history with North Street Records owner Jeff Wilson. It began in 1985 when Mother Murphy’s was more of a head shop with just a few crates of records. Wilson was perusing the record bins on a day an employee quit. Williams hired Wilson to be his record buyer. At the time, Wilson was deep into 60’s garage rock. And their 80’s imitators. 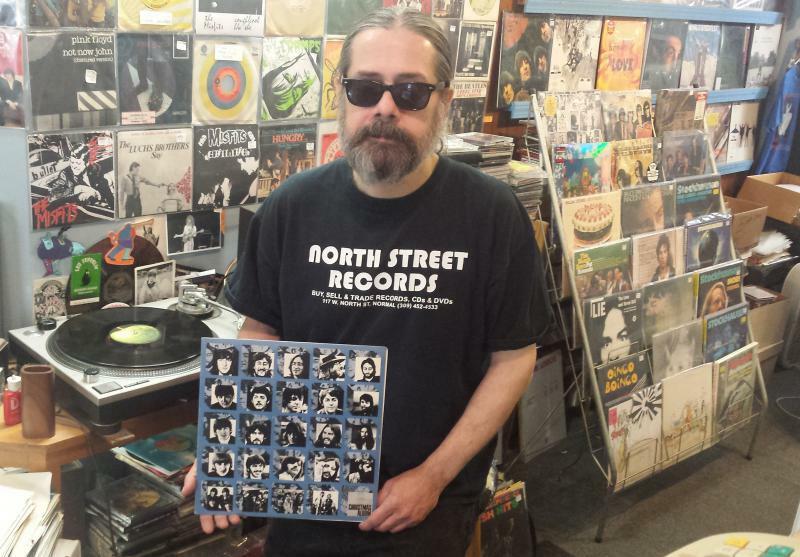 North Streets Records owner Jeff Wilson. Wilson worked at Mother Murphy’s for nearly two decades, and thought he might eventually buy the store. Williams understandably didn’t want to sell what Wilson still calls a gold-mine, so he opened his own nearby storefront in 2004. On a Saturday morning in early February at North Street Records, a man is buying a dozen albums from the dollar bin he probably grew up listening to–the 60’s and 70’s classic rock the stores is known for. 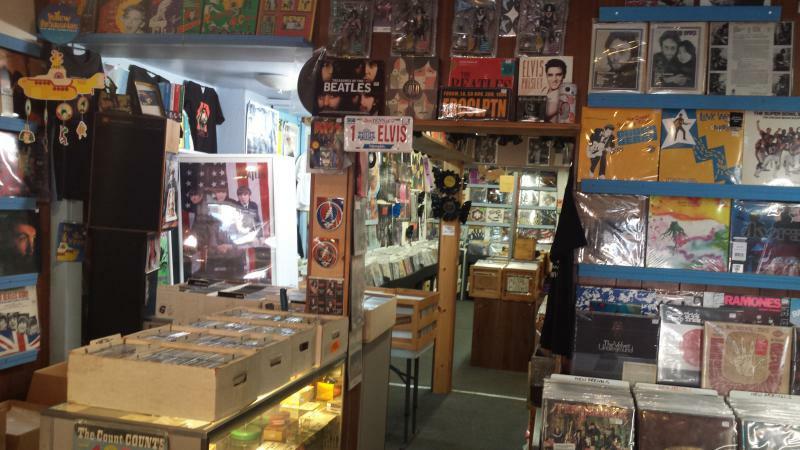 Nearly 80 percent of North Street's sales are vinyl. And if you want to know about those bands, John Anderson of Reverberation Vinyl says Jeff Wilson is your guy. “We happen to have one of the biggest Beatles experts in the country living in this town. Jeff Wilson knows more about the Beatles than … maybe more than 10 other people in the country know what he knows,” said Anderson of his longtime friend. Wilson is humble about his well-deserved reputation. “Man I’m just a fanatic; it makes me appear like an expert. I know some guys out there heavier into it than me. I’m more into collecting the vinyl and foreign pressings and just bizarre versions of songs. Outtakes, bootlegs, anything weird or different, I like to get those,” said Wilson. The third independent record store in Bloomington-Normal is one storefront east of North Street Records. Jared Alcorn opened Waiting Room Records barely a few weeks before Wilson opened in 2004. Alcorn’s bread and butter is new music, especially indie-rock. “Punk does really well. Metal is doing a lot better, but it also depends on the year because it’s a college town and things always change. Couple years ago we did really well with jazz. We also do well with experimental and industrial music,” said Alcorn. Not surprisingly in this tight-knit record community, he also has a history with Mother Murphy’s. It’s when Wilson ran the record side. Alcorn even worked for Wilson one summer at Mother Murphy’s. “He’s one of the best employees I ever had,” said Wilson. Waiting Room Records owner Jared Alcorn. That summer was between stints working for Deadpan Alley Records—located at what was then the corner of North and Beaufort, after a move from the old Appletree Records location. Alcorn started as a 17-year-old, and when Deadpan closed shop seven years later, he bought the few crates of records not liquidated. Alcorn has now owned Waiting Room 14 years, twice as long as his tenure at Deadpan Alley, though working there is where he formulated the vibe he wanted for his own store one day. He’s like a human search algorithm. Not unlike the digital algorithms that Pandora and Spotify pay software developers to create. “It might not be something I’m personally interested in, but I’d like to have a fun conversation about music and I might listen to something and go, ‘Oh you know what, Elliot might like this,” said Alcorn. “Elliot” is Elliot Lusk, an Illinois State University junior majoring in biology. He was in Waiting Room Records on a late January afternoon. Lusk said he also shops at North Street Records and Reverberation Vinyl, and appreciates when store owners get to know his tendencies. “It’s definitely shaped my own musical tastes. Each of them have definitely shown me something, either that or know that I like something and help me decide. They’re like, ‘Oh here, check this out,’ and I’ve dug everything they’ve shown me,” said Lusk. There’s a buzz happening, that … like the local music scene in general, Bloomington-Normal is viewed by many as “the place” for records in central Illinois. Jon Huff is a graphic designer in his late 30s who lives in Champaign-Urbana. “One of the first things we do when we’re traveling is hit up the local record stores,” said Huff. Shopping with friends in Reverberation Vinyl in late January, Huff said feasting on three stores in one stop is a bonus, but ultimately it’s what’s in the bins. It’s also music generally not stocked in chain stores, or easy to find online. “What I didn’t miss when I was just doing digital was being able to go into a store to get those recommendations from someone who worked there. When you’re online, it’s like, ‘Here’s everything … ever.’ There’s no real curating of it,” said Huff. The Twin Cities has roughly 1½ more Record Stores than Peoria, though Peoria has a metro nearly 2½ times larger. Springfield has two 2 stores. Ditto Champaign-Urbana, unless a new store in a space barely larger than a walk-in closet is included. And C-U has a university footprint nearly twice the size of ISU. That’s where Veronica Glatt is a senior in fashion design. 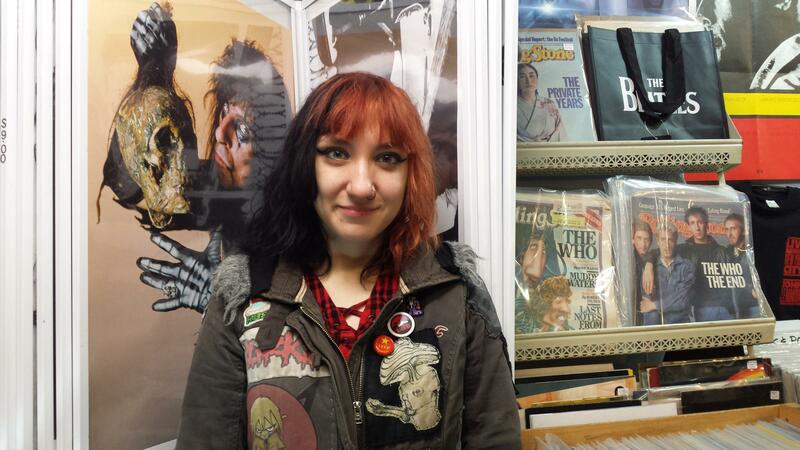 She believes ISU is at least partially responsible for the success of the local record store scene. Glatt has been hanging out in Twin Cities record stores long enough that she now works part-time for North Street Records. She thinks the thriving Twin City record store scene is also related to the vibrant broader music scene with multiple music venues. “We have bigger bands that will come to the Coliseum and then we have the Castle and Meltdown Creative Works. I know people who still have house shows even in this town. 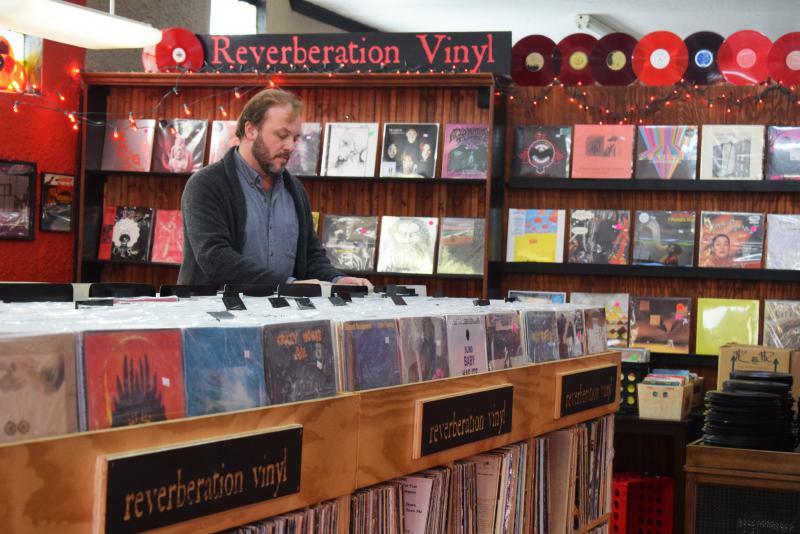 The local music scene is pretty strong so it makes sense that there are record stores that back up the musical interest in this town,” said Glatt. And those local musicians riff off the stores. Aaron Dooley is with the Bloomington-based psych-rock band Gay Neighbors. “There have been so many records I’ve just taken a chance on. Maybe it looks cool or the description of it is interesting. If the bands in town are inspired by that stuff, the people that enjoy listening to the local bands will then be like, ‘Oh what are your influences?’ That just generates more bin-digging,” said Dooley. That bin-digging in the digital age runs the age spectrum. But as they have since the vinyl boom began a decade ago, college students including Elliot Lusk are driving the market. “I guess it kind of seems more real and upfront, and it’s kind of the convenience factor,” said Lusk. When I’m here and I want something, I can go ahead and listen to it and have it right there, right then. Where online I would have to wait the three to five days for shipping." “I feel like it gives me an excuse of things to do. It’s the modern-day drug store, you know, hanging outside as well as shop around, meet friends, and hang out,” said Lusk. 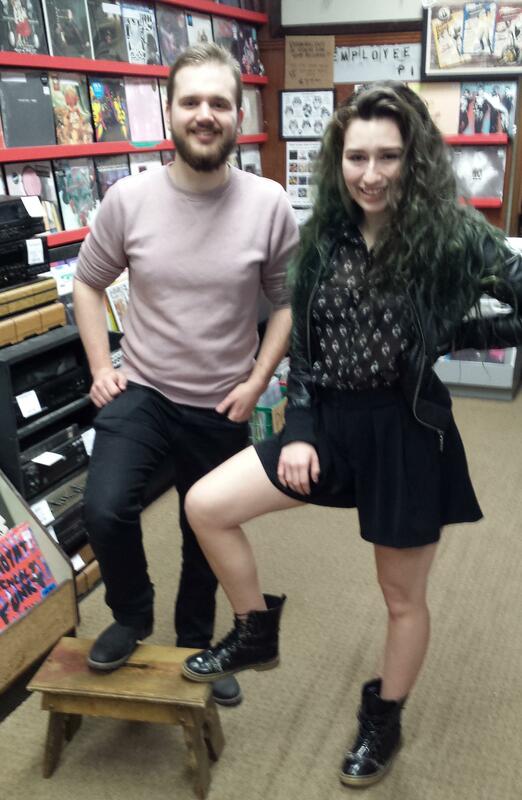 Sydney Mocilan-Kavanaugh is one of those friends he was hanging out with on this afternoon at Waiting Room Records. Record stores as a social hub isn’t new. But it’s interesting that in the digital age, when chains like Best Buy are ditching CDs and soon vinyl, so many especially younger people still crave human contact and camaraderie with their music. 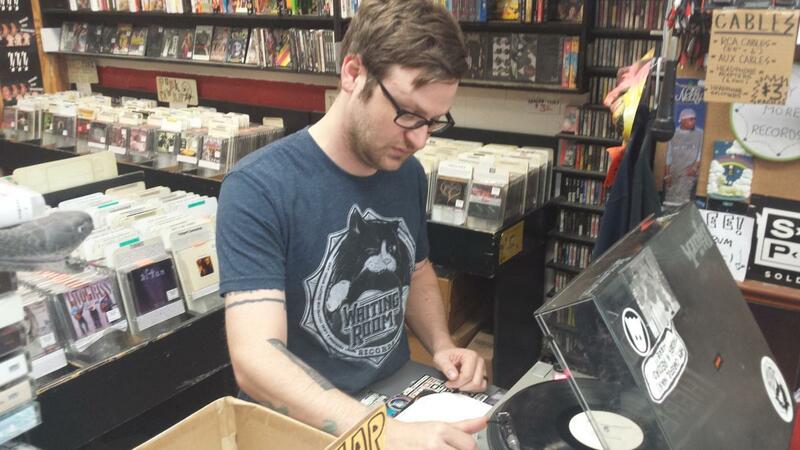 Jared Alcorn at Waiting Room Records cultivates it. “I don’t know how many people come and they’ll say, ‘Well your competitor sent me down to you.’ And I’ll say, ‘Yeah, and I’ll send you right back to them.’ Especially having two stores so close together, why battle about it? We can thrive together if we work together,” said Alcorn. It’s an interesting comment in a dog-eat-dog capitalist society. You’d think Jared Alcorn, Jeff Wilson, and John Anderson would be eyeing each other warily in spite of their three decades of shared history. Like Alcorn, Wilson doesn’t see it that way. Anderson thinks it would be a “bunk” move to try to poach customers from stores owned by guys he has known and liked since he was a teen. For him, it’s not about market share. It’s about mission. Wilson says he’s busier than ever at North Street Records. “I remember when I worked at Mother Murphy’s back in the 80s, we’d play checkers in the summertime because it was so dead out here. I’d get laid off for a month because there was nothing to do in the summer. Now it’s so busy I barely even know when the semesters end because there are so many people in town,” said Wilson. And Anderson doesn’t see this trend going away anytime soon, as kids are again growing up in houses with record players, and people of all ages continue to buy vinyl. 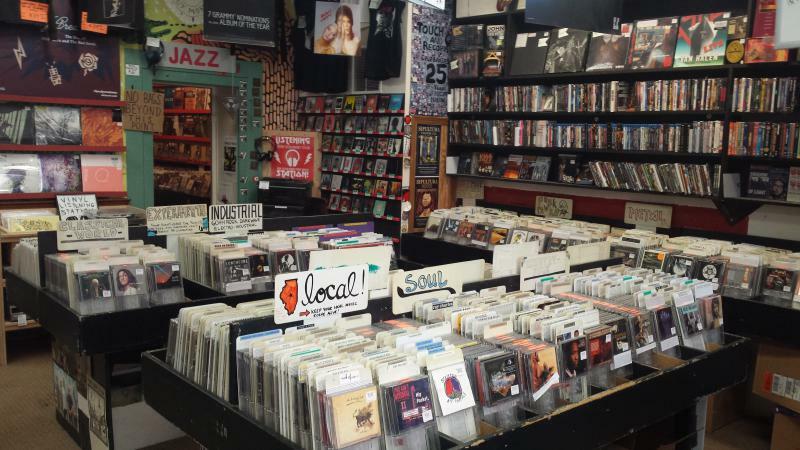 Listen to GLT's full story on local record stores. 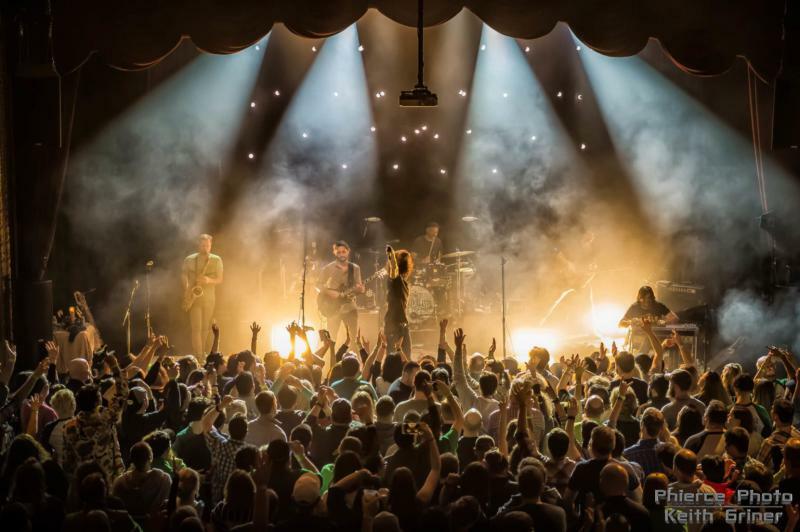 Michael Klug and Joe Borbely of Bloomington’s Jack Dupp & the Empty Bottles say they have seen both the drought and the resurgence of the central Illinois Music scene. Klug said "it’s about time." 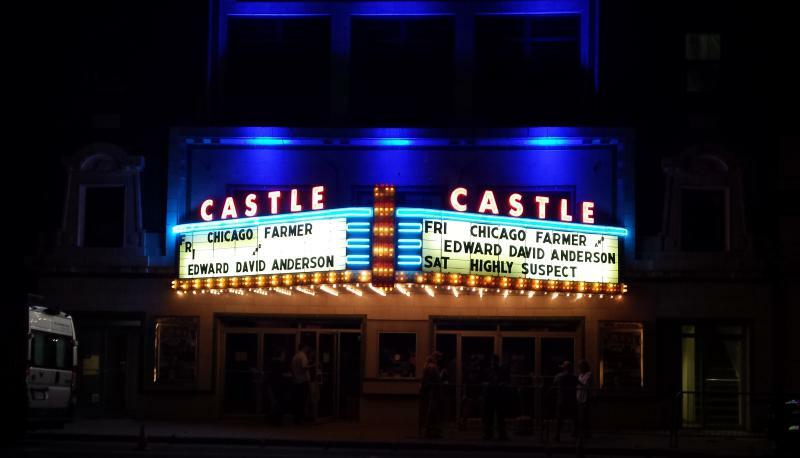 Many local musicians and fans credit The Castle Theatre for a resurgence in the Bloomington-Normal music scene.